SoftPlanet makes it possible for everyone to get free Start8 download directly from our servers. There is no registration needed for downloading. 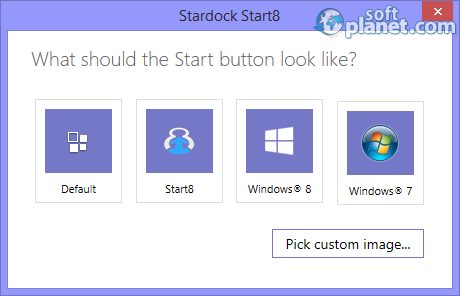 Start8 1.47 is an application designed to work with Windows 8. 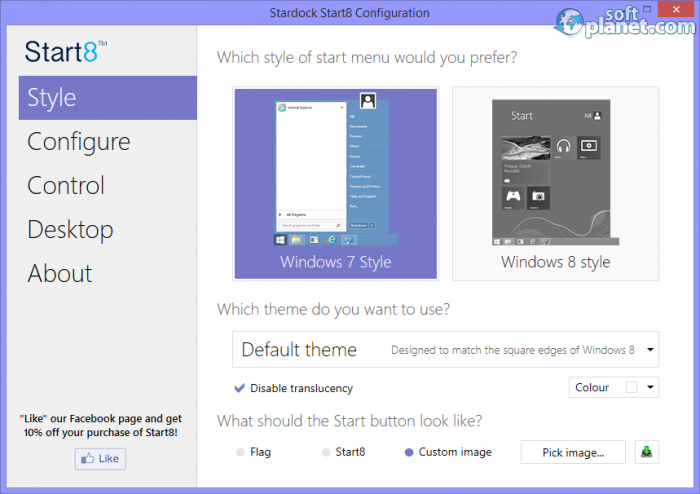 Its goal is to return the smile back on your face if you still miss the standard Start menu. All but the last Microsoft Windows versions have it and if you feel like you are not ready to take the transition yet – this program is the right choice for you. If you want to try it, you can download its trial version for free. The latest program version was just released and it only has some small fixes that only improve the application performance. To see Start8 in action you have to go through a bit strange setup process. After you download the free demo file you have to stop in the middle of the installation and wait until you receive an email from the developer. Then you can click on a button inside the e-mail message and just after that you can continue with the setup. This application works without any problems with any computer and it has many additional features and enhancements when compared to the the original Start menu from all previous Windows versions. Start8 is a nice way to put a Start menu on your Windows. In fact, it has many other features and functions, but the only way to find that out is if you download its trial version. The way you can change its skin allows you to pick a custom one or choose among the existing skins. During our tests we did not experience any problems and advise you to try this useful application. Our security scan shows that Start8 is clean from viruses. The current version of Start8 has been scanned by our system, which contains 46 different anti-virus algorithms. That ensures that Start8 1.47 is 100% safe for your computer.